American Boat Listings™ Listing used boats for sale since 1983. 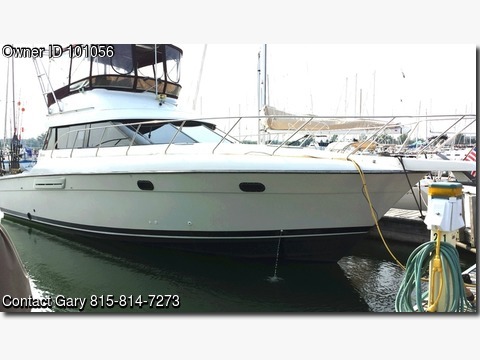 Boat is located in Winthrop Harbor,Illinois.Please contact the owner @ 815-814-7273...1991 Silverton 41C. This is a true live aboard boat than doubles as a salmon fishing machine when desired. Massive interior with front queen, twin bunks and sleeper sofa. Kitchen and dinette that can convert to bed. Vac-u-flush toilet and shower in head. Radar on custom aluminum arch, GPS, Depth Sounder. It can troll over 20 lines at once. 4 Vector electric downriggers. 24 rod holders. 20+ trolling rods including wire lines, lead cores and one copper line. All lures, dipsy divers, etc come with boat. All fishing gear can be removed in 15 minutes. Huge cockpit area with storage below. Sink and fishfinder located here as well. Retiring from boating due to health issues...in water and ready for new owner.